This Kia Stinger is the benchmark setting fastback sedan with an excellent design and a supremely overbearing value. The Kia Stinger is climbing the ranks among performance sedans as one of the best designed vehicle in the class. Heavily comparable to the Panamera in both design and performance, the Stinger is the high valued sports sedan that offers much more than you pay for. A well designed highly supportive cabin holds you in place as you experience the excellent on road capabilities and finely tuned handling that this Stinger offers. This snow white prl* hatchback has an automatic transmission and is powered by a 365HP 3.3L V6 Cylinder Engine. Our Stinger's trim level is GT Limited with Red Interior. 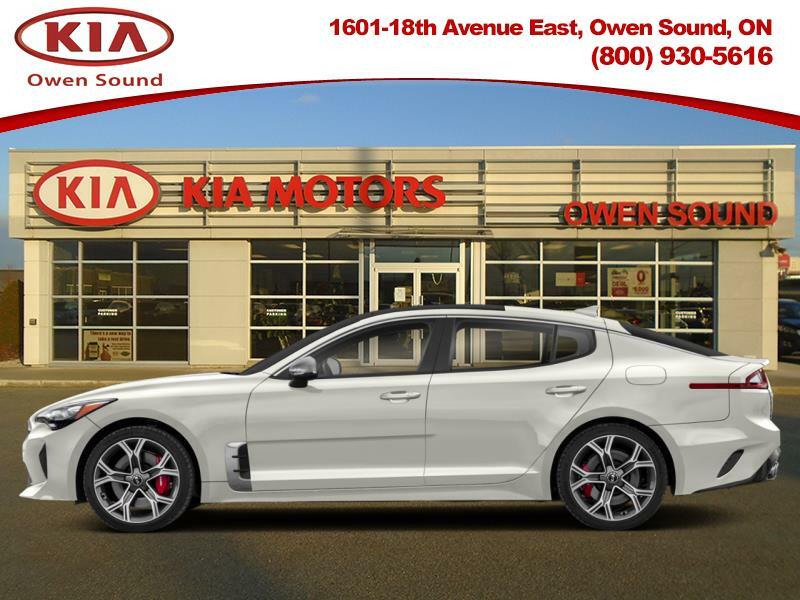 This Kia Stinger GT Limited is a powerful, high tech sedan that is a serious contender to be one of the best while also one of the most affordable within its class. Options include a twin turbo V6 engine paired to an 8 speed sport automatic transmission, driver ride control suspension, dual power sunroofs, a power tailgate, LED brake lights, fully automatic projector LED headlamps, a premium Harman Kardon 15 speaker stereo with an 8 inch display, integrated satellite navigation, Apple and Android smartphone connectivity, UVO intelligence telematics, SIriusXM satellite radio and real time traffic display, Bluetooth, heated and air cooled front bucket seats with power adjustment, a heated leather and metal look steering wheel with automatic tilt away, proximity keyless entry with push button start, distance pacing cruise control, dual zone front automatic air conditioning, a HomeLink garage door transmitter, premium Red Nappa leather seat trim, a day and night auto dimming rear view mirror, a head up display, front and rear parking sensors, blind spot detection sensors, autonomous emergency braking, rear cross traffic alert, lane departure warning, a quad camera array for all sides of the vehicle and much more.